3 weekends into the senior grades and 8 rounds into our junior grades and 5 of our 6 grades are undefeated. Our NRL side is 3 from 3. Reserve Grade is 3 from 3. U20s have had two draws. Girls have won their opening encounter after a bye and Our U16s are 7 from 7. It's a credit to our staff you have rebuilt our pathways. We reversed our trend this week starting out much better. But an injury to Burns exposed our left side and error by Cook that led to a try undid all of the good work and made our second half much tougher than it should have been. Still 11 more wins to qualify for the semis. What can you say, after 2 strong rounds where it was looking like he will have a breakout year and suddenly in the 24th minute he is down injured and being carried off the field in the medi-cab. It was first thought he may have fractured an ankle but after x-rays it was verified as only being a hamstring injury. Let's hope he has a speedy recovery. What a game. It was the first time Souths and Newtown had played in anger since 1983 at Redfern Oval. And the match was a quality first grade standard hit out. The lead changed 3 times in the dying minutes as Souths snatched victory once again this week in the dying seconds. The stand out player was Koloamatangi who power house display up the middle helped set the platform for the eventual win. Another week and another draw. But this time we threw the result away. Twice in the final 10 minutes we had broken the line where a simple pass to the support player would have resulted in a try. Instead both time we decided to throw a long pass which went astray. So instead of being 18 points up with a minute to go were only 6 up and the Bears scored a great try in the corner and the sideline conversion resulted in the draw. With pressure of finals football off, our U18 boys had a great win against Newcastle. Halfback Zampech was the star scoring a hatrick of tries and adding 5 goals for a tally of 22 points for the game and passing 50 points for the season. I expect to see a lot of him during the coming weeks at U20s level. It was a heavy weight clash of the U16s comp when co-leaders Souths and Newcastle sized each other up this week. While it started out as such, in the final 7 minutes before halftime Souths put on 3 tries to take a commanding 20 point lead into halftime. A Top 2 finish is now secured with a match against 3rd place Manly to decide the minor premiership. The girls kicked off their season in style, with a strong 14 point win. The biggest thing we noticed this year was the high turnover of players with 13 of 19 Grand Final squad members no longer in team. All of our NRLW stars have not returned which is very disappointing. There has been a very significant change within the RLIF with the old board structure of former test member nations being revamped to now have 3 independent directors, 2 RFL board members, 2 ARLC board members and 3 board members from the RLEF and the APRLF. The most significant change has been the effect on France, New Zealand and PNG who all now reside within the federations. The other important change was the formal setup of the Observers etc. arrangements across the globe which now aligns with the structure need to gain full sports accord recognition. Interesting that Statistically it was a good game. Completion improved to 80% from 74% last week. Errors were again to 11 this week. We gave away 1 penalty compared to 9 last week. Souths Effective 1st tackle improved to a good level of 25.3m from 37.7m last week. Our missed tackles were at a very good level of 18 missed tackles from 33 last week. Opposition offloads was still high at 16 from 17 last week. Looking at our left side defence - Graham-Burns/Turner-Walker-Sutton/Lowe (1-3-1-3) was improved to 8 missed tackles from 10 last week. On the right side CAllan-Gagai-Reynolds-SBurgess/Lowe (0-2-2-2) was improved to 6 from 15 missed tackles last week. Ruck defence TBurgess/Kennedy-Cook-Tatola/Nicholls-Murray/SBurgess (1-2-0-1) was improved to 4 from 7 missed tackles last week. Our go forward improved to 1731m from 1617m last week. Murray, Lowe, Turner, Gagai, and Burns made 10+m per run. 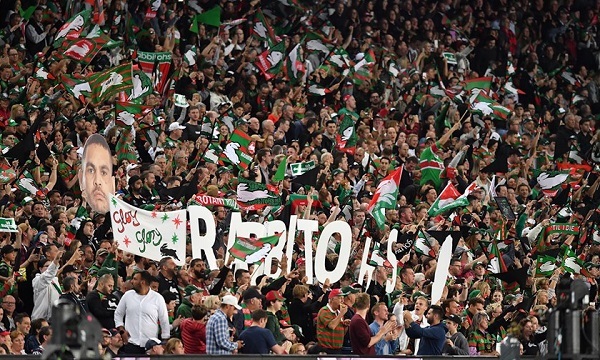 Sam Burgess, Tatola, Murray, Lowe, Tom Burgess, Sutton, Gagai, Johnston and Graham making 100+m in the match. Defensively Cook was our best in the tackling raking up 41 tackles. Tom Burgess, Nicholls, Reynolds, Corey Allan and Johnston didn't miss a tackle.